Nokia has unveiled two new feature phones, the Nokia 108 and Nokia 108 Dual-SIM. The Nokia 108 and Nokia 108 Dual-SIM will start shipping in Q4 this year, notes the company. Both device have been given suggested retail prices of $29 (Rs. 1,817 approximately), excluding local taxes and subsidies. The Nokia 108 Dual-SIM has already been listed on Nokia's official Indian site. and the phones offer expandable storage support via microSD card. They also sport a VGA rear camera without flash. The phones are based on Nokia's Series 30+ software. The Nokia 108 and 108 Dual-SIM come with a 950mAh battery that can deliver up to 14 hours of talktime, and up to 600 hours of standby time (for the dual-SIM variant), notes the company. Commenting on the launch, Timo Toikkanen, executive vice president, Mobile Phones, Nokia said, "We continue to connect millions of people, including those for whom mobile phone ownership was previously out of reach. There remains a huge segment of the global population that has yet to own a camera phone. For the next billion people and beyond, we aim to bring new mobile experiences to ever-lower price points, and the Nokia 108 and Nokia 108 Dual-SIM are great examples of this commitment." 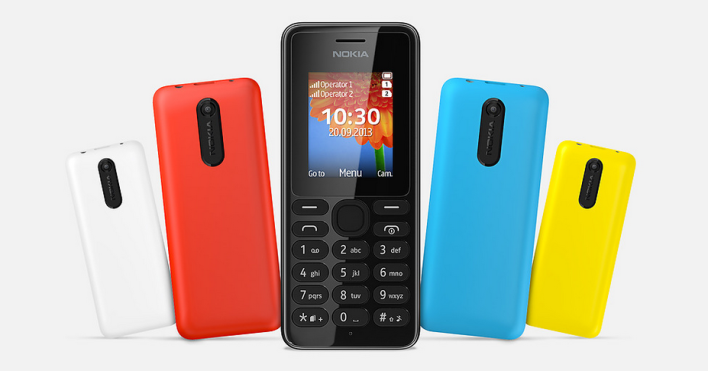 The Nokia 108 and Nokia 108 Dual-SIM will be available in company's signature Black, Cyan, Red, White, and Yellow.